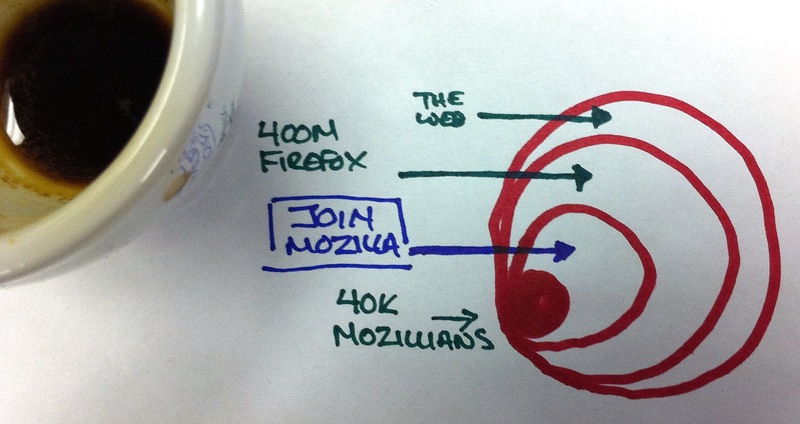 I think a lot about how to increase the size and impact of the Mozilla community. Both are already impressive: 400 million people using Firefox; 40,000+ Mozillians contributing their time and passion. Awesome. In many ways, this is an evolution of user engagement and donations programs we’ve been doing for years. The specifics of what to keep and what to add are still being ironed out. And we will certainly evolve along the way as we try different things. But there is some pretty solid initial thinking already. Over 400 million people use Firefox every day. Many of these people want to do more: to show their support and help in our efforts to build a better web. We need simple, fun ways for these people to connect and engage with Mozilla. Join Mozilla is a first step. Join Mozilla is clear, simple program where millions of people can easily support and keep abreast of Mozilla and the open web. This massive new community of supporters will back (and cheer on!) the work of 40,000+ Mozillians who already contribute their time and passion. Member funds go to grants and projects. They help us create new technologies, spread new ideas, and inspire innovation across the web. You can track the program and how it’s unfolding on the Join Mozilla wiki page. Or you can get involved by coming to one of Mozilla’s weekly community marketing calls. We’ll be talking about Join Mozilla regularly on that call. Also, there is an FAQ if you want more detail or have questions on the info in the slides. Our thinking has evolved quite a bit since we began planning for this program, much of it as a result of ideas and comments from community members. I’m hoping you will offer feedback and ideas as well so we can keep improving our thinking. Please comment, tweet or email me with ideas. Here’s a feedback: I’m not donating a penny unless there’s absolutely no way for me to contribute to Mozilla (answering questions at SUMO, for example). And if there’s absolutely no way for me to contribute to Mozilla (for example, if I can’t give my opinion on discussion groups), I’m not donating a penny. Support is about doing something, not about giving money. The matroska doll up there is critical. Each group is enclosed in the other. Web community > Firefox users > potential supporters > current contributors. I think some confusion comes from the fact that “current contributors”—people who are actively coding and localizing Mozilla software—are enclosed in the $$$ supporters camp. It’s absolutely clear that current supporters are in a class of their own, but the graphic suggests otherwise. Instead of visualizing this like a matroska doll, with smaller and smaller subgroups, I’d draw it as a Venn diagram. Some percentage of active contributors will give money, some won’t. Some Firefox users will give money, many won’t. Perhaps most surprisingly, some people who give money won’t be Firefox users at all! I can see Chrome and Safari users voting with their dollar because they recognize the stewardship role Mozilla plays. And maybe users of Popcorn, Hackasaurus, and other Drumbeat projects will someday find those projects reason enough to give money. What kind of incentives will be offered to potential supporters? That’s probably subject for a blog post of its own, but what if supporters could indicate—as part of the process of joining—what initiatives they care about? There could be a loose connection between what people say they want to support and what gets MoFo’s weight. With the hope it can be helpful in any ways. « Members as advocates for the web? You are currently reading Join Mozilla: support the web, simply at commonspace.